Scienceray has a nice list of "8 Essential Gadgets for a Secret Agent." Some are a little yawn-inspiring. However, a couple are downright FANTASTIC. 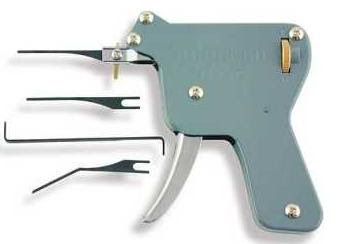 For instance, the lock-picking gun shown above is the sort of thing I dream about. (When I'm not having nightmares about giant stingrays.) Unfortunately, the link on the site doesn't appear to work! Will I never be able to get my hands on one of those marvelous gadgets--which I would use not for crime, but for the benefit of all humankind? You're right; most of them are really dull. But he just messed up the link: if you want to see it, here it is. i want the voice recording pen, bcuz i like writing, and recording myself singing. hey check out david belle!!!!! Ms. Bookworm: Your spelling is better than mine! Invisible Turtle: A wonderful use of shopdropping! Jin Ai: Thanks! I thought the miniature GPS device was rather awesome as well. Anonymous: You're a fan of parkour? I'm so impressed. Monsieur Belle is one of my personal heroes. There was a post on this blog about him a little while ago . . .
the lockipicking gun is really cool! Sekrit7: Very, very clever and witty. hmmm. the link worked for me. They're probably not listed listed for those who won't use them for the better of (most) humankind (like me...oh the possiblities...). By the way I just joined a group called The Irregulars on girlsense.com. coooooooolllll!!!!! yay lock picking guns! SameAnonymous: I hope you're never old enough to smoke. It's nasty.